Update 3-1-19: Well, I don't know where my head was when I wrote this post but clearly I let it fall through some crack or another. When I think about it, if I think about it, I have to admit my love of blogging has taken a left turn and my not return at all. At any rate, it would be a waste of a good recipe if I didn't post this one, it's that good and that easy. Read on for a glimpse into my psyche in 2016. I had thought I was finished with this blog, posting here and there over the last few years with lots of time and space in between, then falling off to one or two posts a year in a feeble attempt to keep it going. My life changed drastically over the fall of 2012 and the beginning of 2013 and the joy I took in creating recipes and cooking to post on this blog fell to zero. Here it is, 3 years later (now 6), and the urge to share is returning to me. I don't promise recipes every day, or even every week, in fact I don't make promises anymore at all. But I still do cook, and Mr. CC keeps telling me to "write it down, Sweetie." So now I begin again. And where better than with a dish fit for Autumn: A simple, put-it-in-the-oven-and-walk-away recipe that befits the shorter days and crispy-cool nights that promise more warm and inviting dishes from the oven. Heat oven to 370-degrees F.
Drizzle oil in a Dutch oven or other oven-safe lidded casserole and wipe the bottom and sides with a paper towel (I used a Staub Cocotte, which I happen be lucky enough to own, but any cast iron Dutch oven works just as well). Season chicken thighs with salt and pepper to your liking and arrange on the bottom of the pot. Peel the garlic cloves and slice in halves or thirds, depending on the size of the cloves, and push between the chicken thighs. Cut the lemons into quarters (or eighths, depending on size) lengthwise, then cut off the stem end and slice off the center of each wedge to release the seeds. Remove the seeds and push the wedges between the chicken thighs. 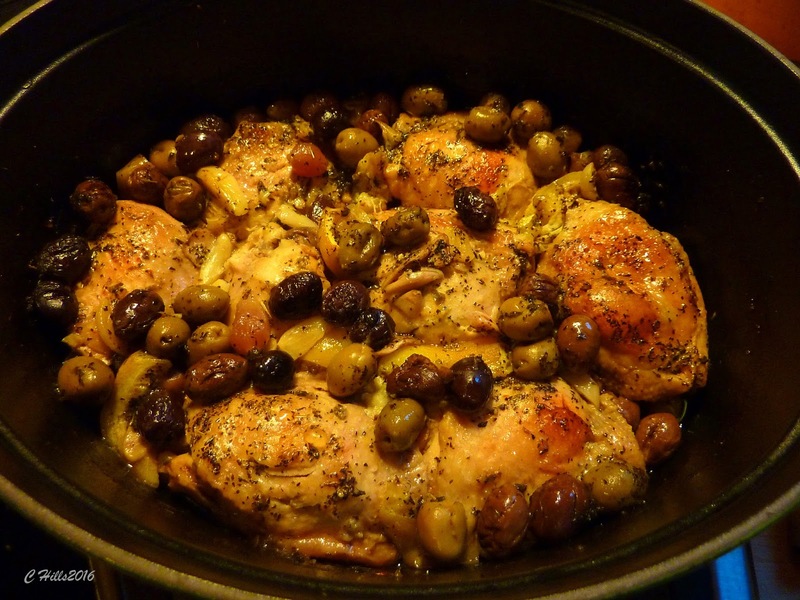 Sprinkle the olives over the top of the chicken, then sprinkle the herb mix over all. Pour 1 cup of the chicken stock over the chicken until it barely covers. Cover with a lid and place in the oven on a centered rack, and braise for about 2 hours, removing the lid for the last 20 minutes. Check after an hour or so and add more chicken stock if needed. When the thighs are falling off the bone, take the pot out of the oven and let it rest for at least 15 minutes and up to 1/2 hour. You can pair this dish with cooked rice, polenta, or simply good sour dough bread to sop up the juices. March: She is a sultry, wanton wench with her come hither dance toward Spring as she promises warm breezes and sunny skies then slams the door in your face just as you begin to lose yourself in her lies. March's ritual of a day of sun followed by four days of rain, repeat, keeps my food hankerings in a tizzy. What I crave this time of year, when Spring begins to flirt with Winter, is strawberries and asparagus. What I make, when March decides to turn on the faucet, is soup. And when nothing but tomato soup will do, with nary a sun-ripened tomato in sight, I turn to those delightful tomatoes in a can: San Marzanos. This is a simple, belly-warming soup that can be whipped up inside of an hour. Make it thick and chunky or smooth and creamy with no dairy added. Make it vegan by using vegetable stock and omitting the butter. Make as much or as little as you want, adjusting the ingredients accordingly. Several teaspoons olive oil and butter for the pan. Have a large stock pot ready on the stove. Put the oil and butter in a skillet over medium-high heat. When hot add the onions, carrots and optional celery and saute until just softened, about 7 minutes. Adjust the heat so the vegetables don't burn. When the veggies are soft, add the garlic and saute another minute, stirring so the garlic doesn't burn. Turn off the heat and transfer the vegetables to the stock pot. Add the tomatoes to the skillet and break them up, deglazing the pan in the process, then add to the stock pot. Turn the heat under the stock pot to medium-high and add the chicken stock and the thyme, if using. Bring the soup to just under a boil then reduce the heat and simmer for about 1/2 hour or until all the vegetables are very, very tender. The liquid will reduce a bit during this process. Adjust the seasonings with sea salt and black pepper to taste. When done, turn off the heat and allow the soup to cool slightly. If you are using fresh chopped basil, add it now. Blend the soup to the consistency you desire, using a stick blender right in the pot, or by transferring in batches to a food processor or blender. If the soup is too thick, add a bit of stock. 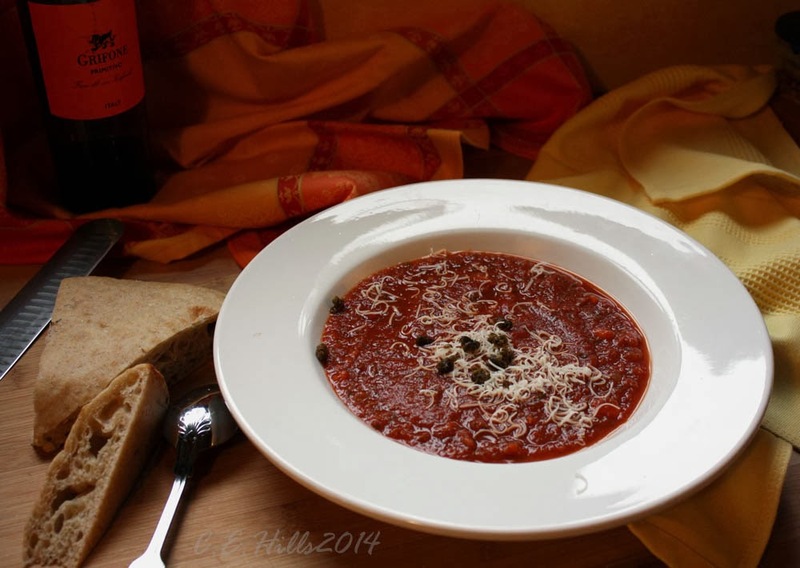 To make a fancy presentation, ladle the soup into wide, shallow, heated bowls and sprinkle with fried capers and grated Gruyere. Enjoy while the weather is fickle! Sharp eyes will see that the photo at the top is watermarked with the year 2014 and indeed that is when it was taken. I make this soup a lot when the weather is chilly and this particular photo was the best representation of the recipe. Update 12-31-14: I re-made this today to take to a new year's potluck gathering, adding smokey ham and substituting rich chicken stock. I left out the red bell peppers and added 4 diced carrots to the saute. It's rich, earthy, and has a wonderful salty-smokey element from the ham. Happy New Year! 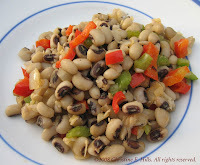 Black-eyed peas, especially in the form of Hoppin' John, are traditionally served on New Year's Day as a symbol of prosperity and good luck during the coming year. 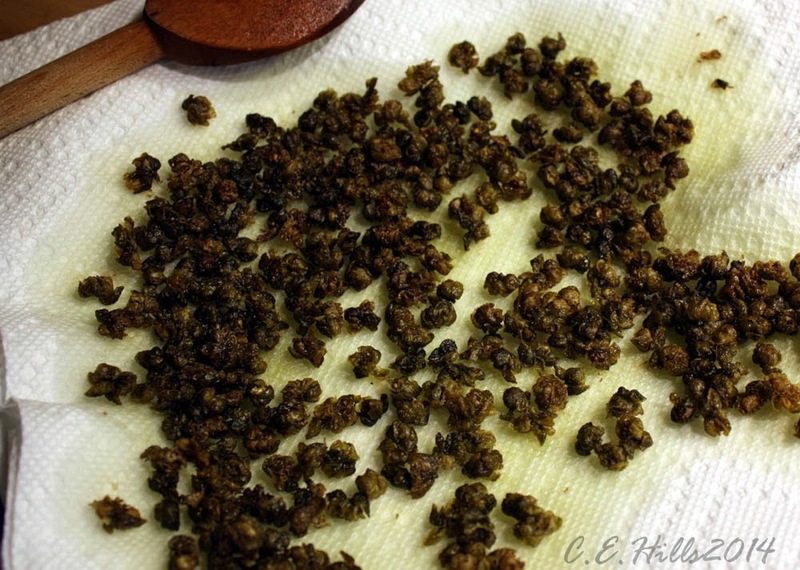 Originally a southern dish, it has gained popularity and can be seen in many recipes this time of year across the country. What I've made here is a very loosely-based compilation of some of those recipes. For my rendition of Hoppin' John, made for a crowd of 18, I started with tubs of Melissa's black-eyed peas, available in most supermarkets this time of year. Traditionally prepared with bits of inexpensive meat, I omitted the meat entirely, making it vegetarian/vegan friendly, and gave it a kick with a bit of cayenne and Meyer lemon juice. This makes a great side dish any time that black-eyed peas are available so don't put it off just because New Year's Day is almost over. Here's to your good health, good luck and prosperity in 2009! For each tub of peas, put 2 1/2 cups of water in a large stock pot. I cooked all 4 tubs in 10 cups of unsalted water. Bring the water to a boil then add the black-eyed peas and give a gentle stir. Allow the water to return to a boil then reduce the heat so the peas simmer for about 10 minutes or until tender. Drain the peas well and return to the stockpot. Meanwhile heat the oil in a large heavy skillet (I always use cast iron) over medium-high heat. Add the chopped onions and celery and sauté for 3 minutes. Add the garlic and red bell peppers and sauté until just tender. Don't overcook. Add the sautéed vegetables to the hot peas and stir gently. Add the Meyer lemon juice and the cayenne pepper, stir to blend. Put the mixture over medium-low heat and add the water or broth a little at a time until it reaches a consistency you can live with. The peas will absorb most or all of the liquid. Adjust the seasonings with kosher salt and freshly ground pepper to taste. Serve as a side dish accompanied by steamed rice and greens for truly traditional southern fare. If you wish to prepare just 1 11-ounce tub of peas, adjust your sauté by about one quarter. That said, the ratio of veggies to peas could be as much or as little as you like. Should you have leftovers, you can buzz them in a blender the next day to make a spectacular spread for crackers or crusty bread. I just happen to have cilantro growing in my garden (still!) and even though I share it with my cilantro-loving chickens, I had enough to use here. Lucky me. One more thing that I forgot to add: Hoppin' John may be made much more stew-like by adding more broth. You can serve it over steaming hot rice for a more traditional feast. Be sure to adjust the seasonings accordingly. Two weekends, 40 pounds, eight baking sheets, one major f**k-up, and, finally, success! Even as I read and read, and read some more, about slow roasting tomatoes, there are so many different versions out there (right? ), so many disparate oven temperatures, ways to cut, sprinkle, or not, drizzle, or not, remove seeds, or not, roasting times: 8-10 hours, 5 hours, 3 hours, overnight, that I finally threw up my hands and went with what I knew in my brain and heart. And even with that I had a few bumps before getting it right. The first bump was just silly: I went to a potluck party while my first batch of tomatoes was merrily roasting away, and roasting away (albeit at 260-degrees), and roasting away (while I forgot about them) to burnt crisps. That went into the compost and the oven fan had to be left on overnight to rid the house of the burned tomato smell. The second (and, actually, third) bump resulted in so-so variations: in a 250-degree oven for nine hours to a 260-degree oven for seven hours, with the tomatoes swimming in to drizzled on olive oil* that both versions took forever to lose enough water to package. They are packed, and in the freezer, but they are definitely second rate. A week went by while waiting for the Saturday farmers market to come around again so I could buy another lug (20 pounds) of tomatoes, and with this batch I finally reached roasted tomato nirvana (well, my roasted tomato nirvana) and this is the version that I share with you now. Organic slicing tomatoes from Neukom Family Farms in Willow Creek. You will notice that I have not used heirloom tomatoes for roasting. Heirlooms, to my palate, must be savored fresh: in salads, out of hand, in a BLT; never in the oven nor in a sauce. Organic slicing tomatoes from Green Fire Farm in Trinity County. These beauties - just above - are what I roasted yesterday (see top photo). They were cooled, frozen in their trays, then packed into zip-top freezer bags, labeled and, finally, put back in the freezer. I found that the easiest way to get rid of deep-set stems is to make a small slit near the stem with a sharp knife, then insert a melon baller and scoop around the stem. Easy peasy. 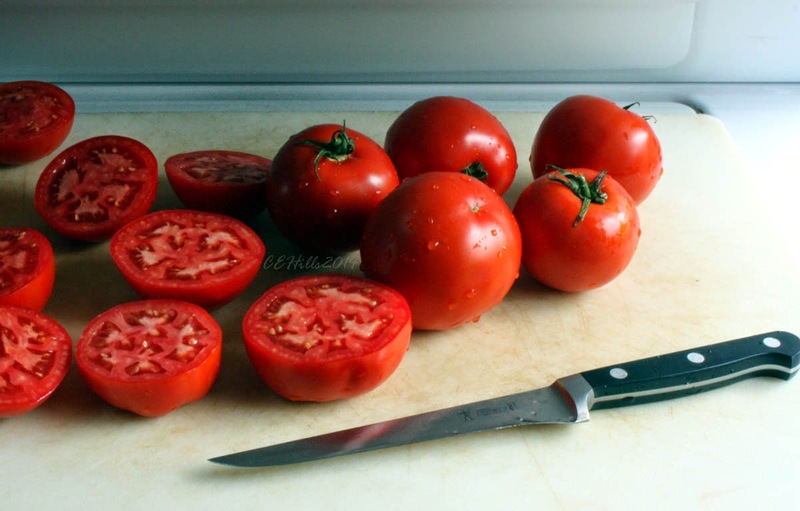 Use a sharp knife to cut the tomatoes in half crosswise. My Wusthof boning knife was the perfect tool. 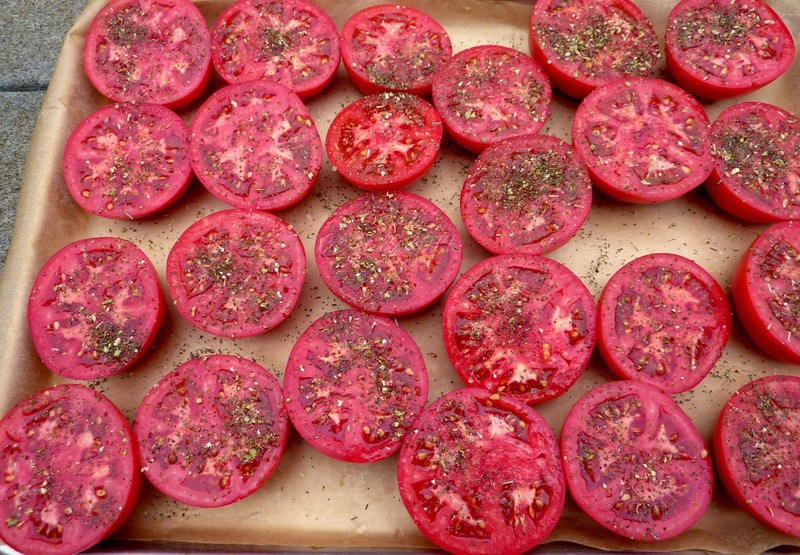 Lay tomatoes skin side down on parchment-lined baking sheets. Had I written down the steps I used last weekend they would have read: sprinkle with herbs, sea salt, then drizzle with olive oil. But I didn't like the texture of any of the tomatoes that had olive oil so this time I decided to omit it to see if I would get a firmer, drier tomato. That, for me, turned out to be a good decision. I am much happier with the results (see up close photo below for today's batch). As you will see below, this is more of a step-by-step instruction than a recipe. I used dried Mediterranean herbs because that's what I had on hand but if you have rosemary and thyme growing in your garden that have not succumbed to the California drought, they would be even better. Note that I did not add garlic to the mix. In my humble opinion, garlic can (and will) be added to any of the dishes I make with these tomatoes in the months to come and do not need to be added in the roasting process. Preheat oven to 285-degrees Fahrenheit (140.5 celsius/Mark 1). 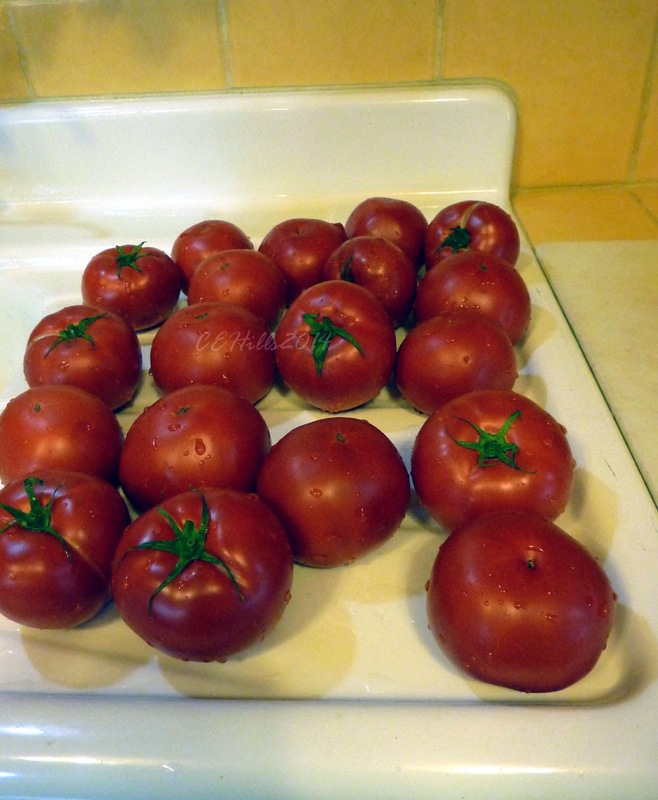 Remove the stems from the tomatoes (see caption above). 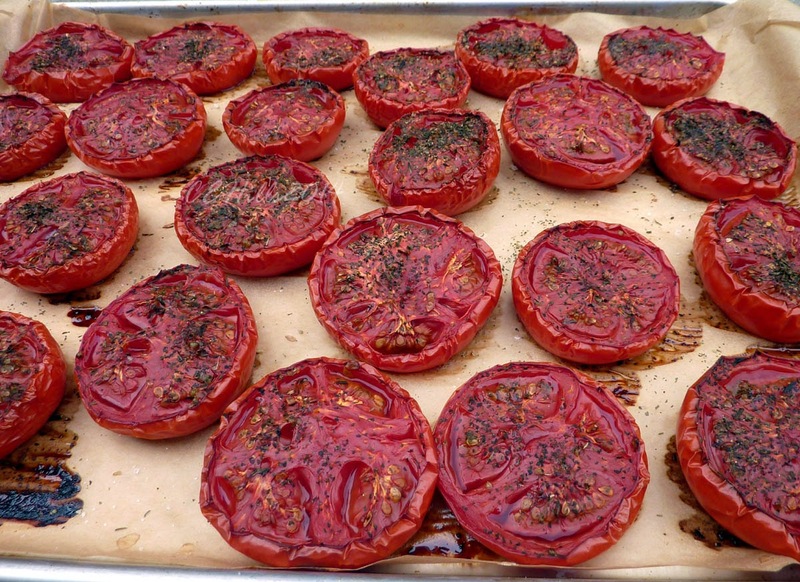 Slice tomatoes in half crosswise then place on parchment-lined baking trays (mine are 18" x 13"). 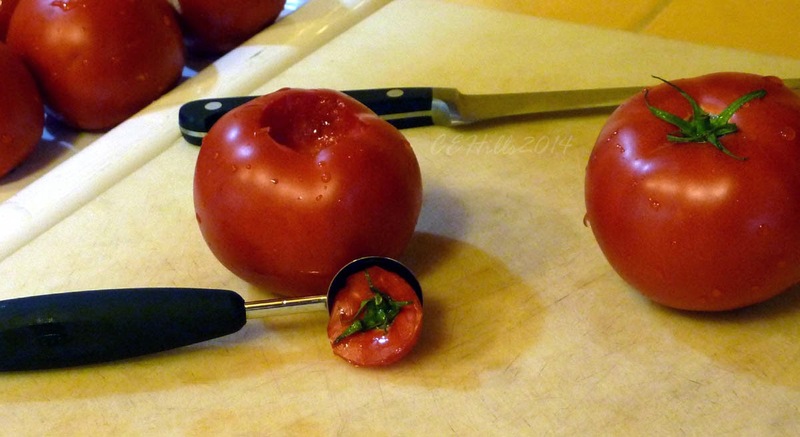 It's OK to crowd the tomatoes as they shrink in the oven. Pinching between thumb and forefinger, sprinkle tomatoes with the dried herbs - about 1 heaping tablespoon per tray. Again, pinching between thumb and forefinger, sprinkle tomatoes with the coarse sea salt. I used about 4 pinches for one tray. Place the trays in the oven and slow roast for approximately four and one-half hours (4 1/2), alternating trays on the racks mid-way. 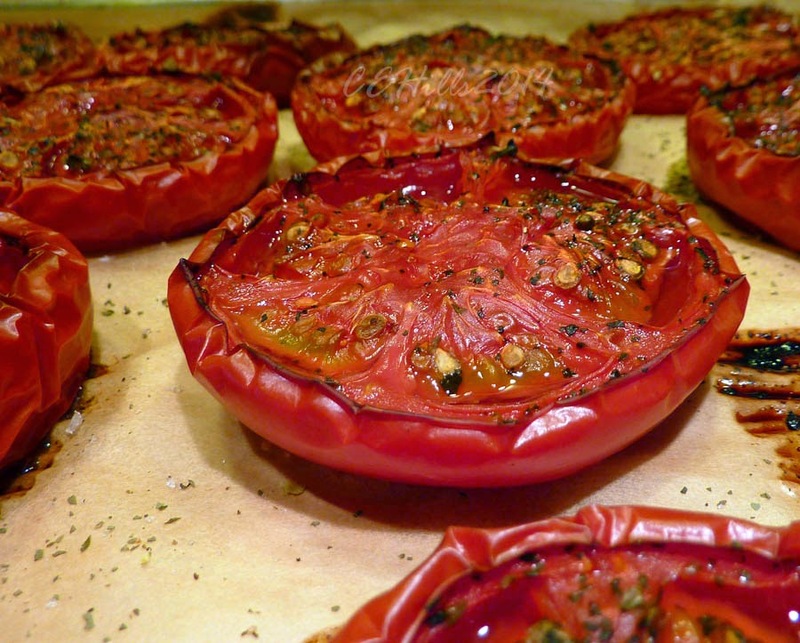 Remove trays from oven and allow tomatoes to cool entirely. 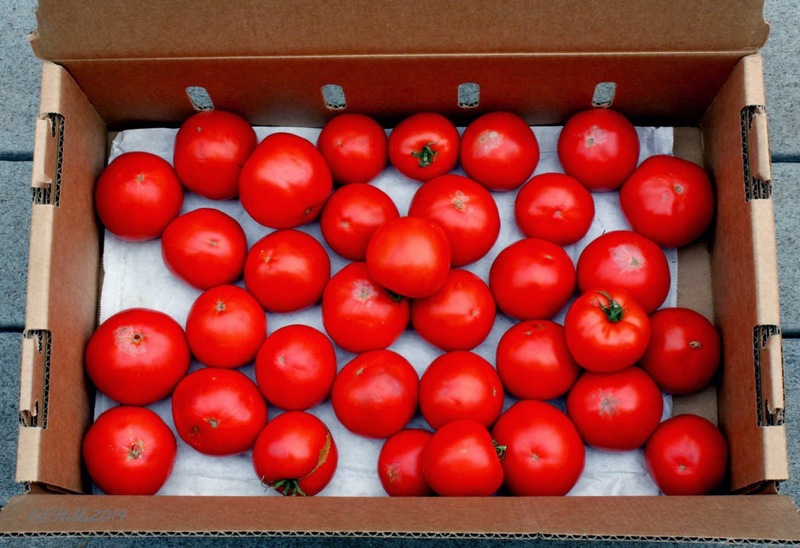 When cooled, place the trays of tomatoes in the freezer and allow to freeze for several hours or until each tomato can be picked up and not be sticky. Pack the frozen tomatoes in single layers in zip-top freezer bags, carefully expelling as much air from the bag as possible. Label each bag with the date and then bag again in another zip-top freezer bag, again expelling the air. Put bags in the freezer and be prepared to relish their summery taste in soups, stews and braises over the winter months. It's not like I've never slow roasted tomatoes before, I have, back in 2009. *It was the olive oil. I couldn't get past using olive oil. And much as I love olive oil paired with tomatoes, roasting them together just didn't do it for me. The steps I've taken above result in intensely flavored, non-oily tomatoes that I know I will enjoy over the coming winter. Peaches ripen later on the north coast than in hotter-in-summer parts of the US, which makes July the start of the season for our truly local ones. 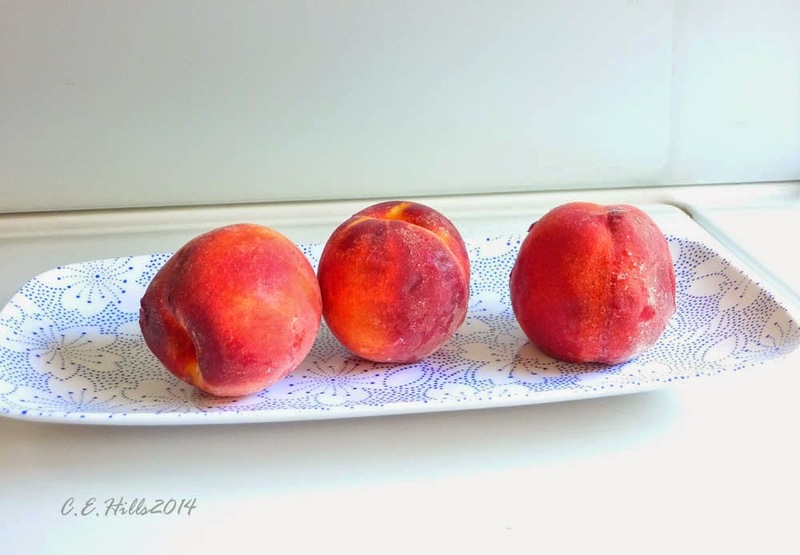 The peaches pictured below hail from Neukom Family Farm and may be found these days at local farmers markets; they're sweet, dribble-down-your-chin juicy, and they make a terrific ice cream. 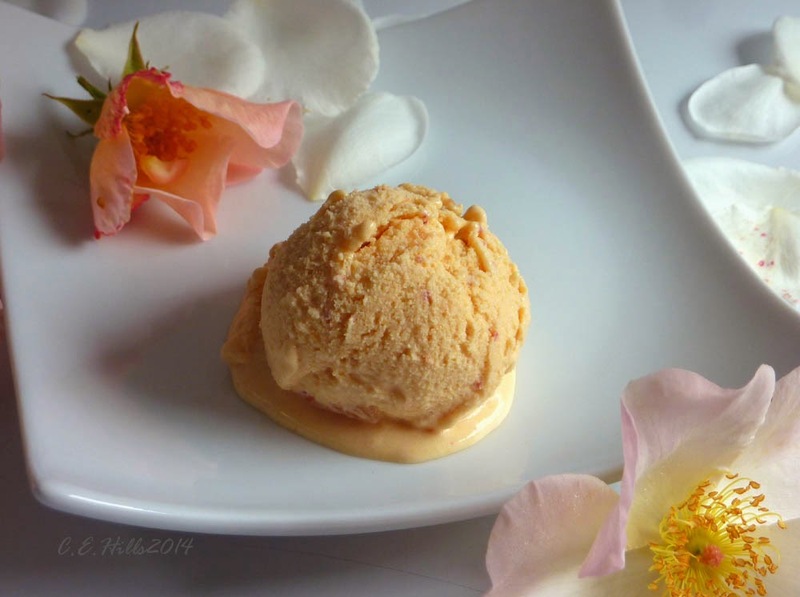 Keeping an ice cream recipe simple is really not my style, and here, not being able to leave well-enough alone, I've added a French ginger liqueur and chopped crystallized ginger to mix things up a bit, making for a more, dare I say it, sophisticated dessert. The liqueur also helps to keep the frozen ice cream from turning into a brick, making for easier scooping. That said, please feel free to leave out both of those extra ingredients if you prefer; their absence will not affect the finished product. 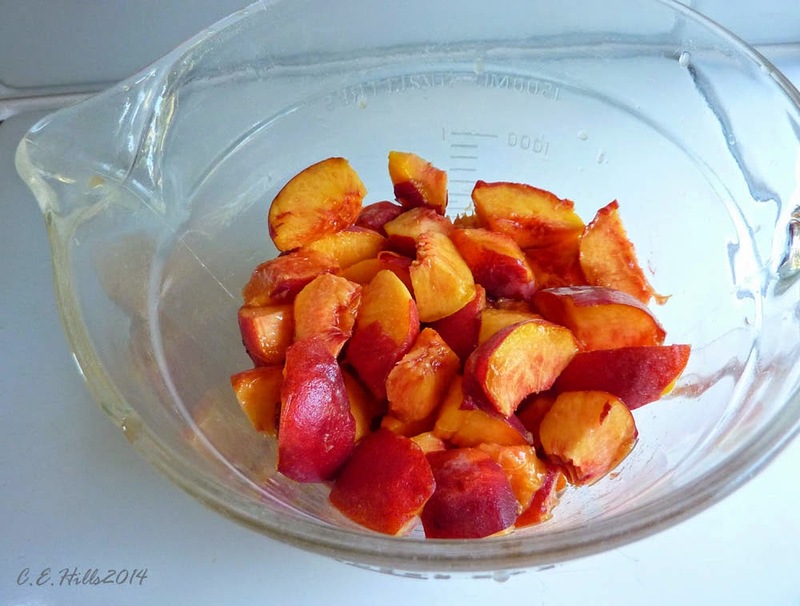 Chop the peaches into chunks and put into a food processor along with the lemon juice, ginger liqueur (if using), 1/3 cup of the sugar, and the salt. Purée until all the peaches have liquefied and no chunks remain. Set aside. Whisk (or use a hand mixer) the egg yolks with the remaining 1/3 cup sugar until the yolks are pale and thickened. Bring the milk to a simmer in a medium sauce pan over medium heat, until small bubbles form around the edge of the pot. Do not let the milk boil. Whisk about one-third of the hot milk into the egg yolk mixture, then whisk it all back into the hot milk pan on the stove. Heat on medium, stirring constantly with a wooden spoon, until the custard thickens slightly and coats the back of the spoon. Drawing your finger down the coated spoon should leave a track in the custard. Keep the heat on the conservative side of medium and take good care to not let the custard curdle. Remove the pan from the heat and pour the custard (through a strainer, or not) into a glass bowl or 8-cup glass measure. Allow the custard to cool for about 15 minutes then stir in the heavy cream. Cover the bowl with plastic wrap and refrigerate until cold; overnight is best for thorough chilling. Process in an ice cream maker according to the manufacturer's instructions, adding the chopped ginger when the ice cream is semi-frozen. Pack into container that has a tight-fitting lid and place in the freezer for an hour before serving. My preference is to make fruit ice creams with their skins on. I feel that the skins add to the texture and color of the finished product. Please put your custard through a fine mesh strainer if you don't wish the tiny bits of skin to be present in your ice cream. 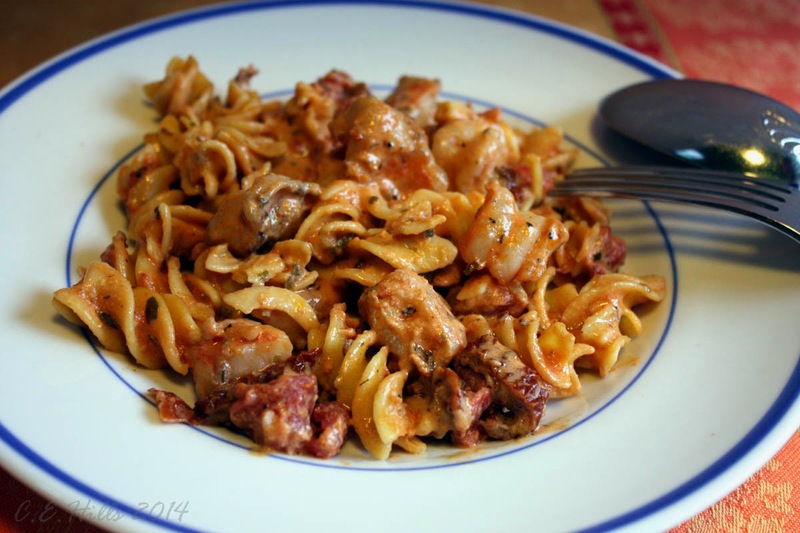 This recipe is a variation on one that I hadn't thought about in years. It appeared in the Sunset Recipe Annual 1988 Edition: Every Sunset Magazine Recipe and Food Article From 1987. Now the other day, when I bought a pound of medium (21-30 per pound) shrimp, I had no idea I would make this dish. I was musing on lighter, spring-is-approaching food and thought I'd make a quick shrimp and vegetable stir fry. It wasn't until I passed a display of this gluten free pasta that the kernel of a recipe took hold as I vaguely began remembering making a cream and vermouth-based pasta sauce so very many years ago. 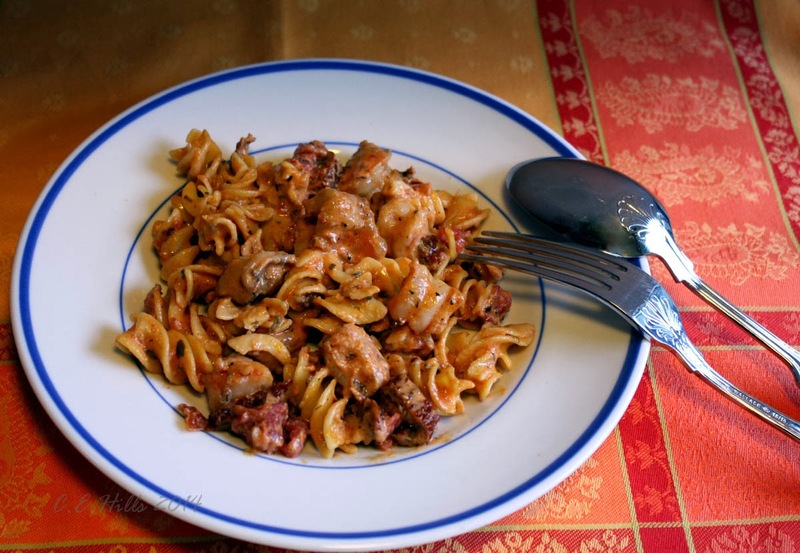 Having recently spent several weeks sorting through my considerable library of cookbooks, donating some to our local library, taking some to a used bookstore, and shelving most in my new(er) office bookshelves, it was easy to look back through a few older cookbooks until I found the recipe: Pasta with Shrimp in Tomato Cream. Having some but not all of the specified ingredients, I did my own riff and pretty much changed a Mediterranean-ish recipe into one with a Creole bent using my recently purchased Lucile's Creole Seasoning. And how perfect is that for Mardi Gras month? Fill a large pasta pot with water and bring to a boil. Hold at medium heat after boiling until adding the cream to the sauce (see below). Heat 2 tablespoons oil in a skillet large enough to hold the shrimp and sauce. When the oil is hot, add the cut shrimp, sprinkling with the Creole seasoning, and saute until pink all over. Remove to a plate and cover to keep warm. In the same skillet in which you cooked the shrimp, add the diced tomatoes, sun dried tomatoes, chicken stock, vermouth, dried herbs, and ground green peppercorns. Stir to loosen the bits that may be stuck to the pan and bring to a boil. Boil until the sauce is reduced by one-half. Season to taste with the Creole seasoning (remember, the shrimp has already been seasoned with this) and add the cream, stirring to blend. Boil again until reduced by one-half, or pasta sauce-thick. Remove from the heat and stir in the cooked shrimp. Begin cooking the pasta in the boiling water around the time you add the cream to the sauce. The gluten free pasta listed here will be al dente in about 6 minutes. Immediately drain the pasta in a colander or fine-meshed sieve and then add to the thickened sauce, off heat. Stir gently until all the pasta is coated with sauce. Serve immediately with a green salad and crusty bread of your choice for mopping up the sauce. Creme Fraiche may be substituted for the heavy cream. Try to purchase organic food items whenever possible; they just taste better. Show of hands, please: How many of you cooks out there, while perusing fridge and pantry for dinner inspiration, come across more breakfast ingredients than dinner ingredients and ask yourselves, surely what's good for breakfast should be just as good for dinner? I'll bet there are many of you. Well, bloggers Lindsay Landis and Taylor Hackbarth, of Love and Olive Oil, have taken that idea multiple steps further and have written a delightful cookbook that is all about having Breakfast for Dinner, which was released just yesterday and is now on bookshelves waiting for you to pick up and take home to your kitchen. When I received my review copy in the mail several days ago, the first thing that impressed me was how well put together this cookbook is, with beautiful photography that accompanies each recipe and easy-to-read recipes that each fit on a single page. The book is neatly sectioned into categories beginning with Getting Started, which shows you what Lindsay and Taylor keep in their fridge and pantry as basics, to, well... getting started. From there, it's right into the recipes: Mains, Sides and Starters, Drinks, and Desserts, with several how to sections on making a few of the recipe ingredients (for example, the simple sweet crepes that are used in a bananas Foster crepe cake!) ahead of time. 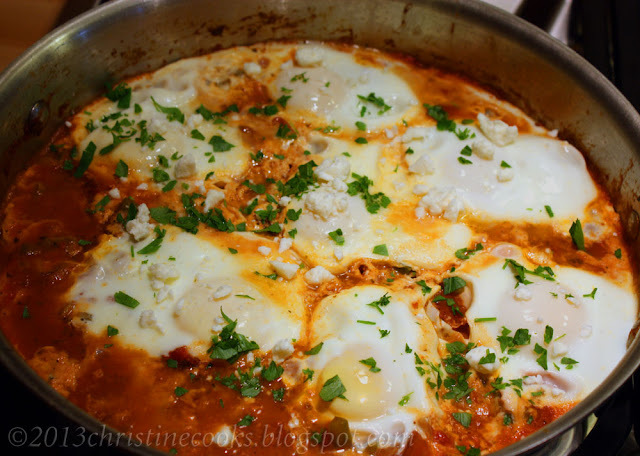 Last night I served the Shakshuka, photos above, to my family and received eye-popping raves. 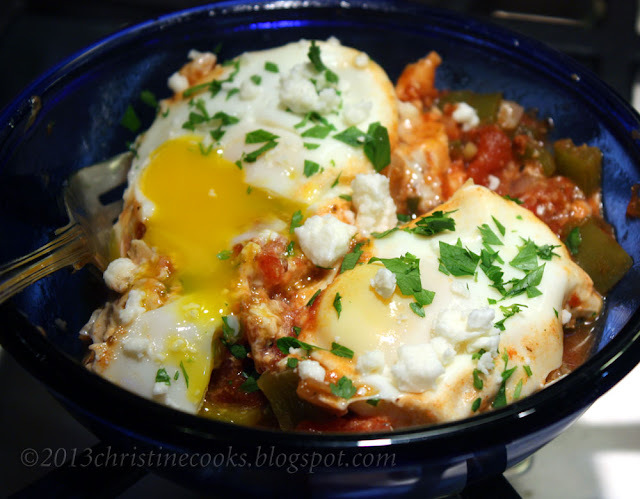 A well-stocked kitchen will have most or all the ingredients already on hand: eggs, good-quality canned diced tomatoes, a few herbs and spices, some zesty fresh peppers and a bit of feta cheese. Simple, easy, and delicious. This weekend I'll be making the Cornmeal Pancakes with Beer-Braised Short Ribs and an Earl Grey Panna Cotta for dessert. And if that sounds good to you, I suggest you buy this book. Now.